I first saw this on Pinstar‘s Legacy Challenge stream the other day (link is to the YouTube upload), but it seems that in Willow Creek, the museum bathrooms are THE place to be in town. Last I saw he’d screenshotted 8 people in the bathroom – I managed to get 9, though one of them is a child. I say ‘managed’, but in fact I had nothing to do with it; Parcheesi showed up at the museum with a handful of friends and friends-to-be (she hopes), and by the time she got inside this was where everyone was. Today we’re aiming to get 7 friends (she has 4 right now) and some piano practice so that we can get promoted to level 7 musician. I’ll admit, I miss my fave EVER lifetime points reward from Sims 3, which was Long-Distance Friend. I used it literally with every single character, because I felt the burden of maintaining friendships in Sims 3 was unreasonably high without it — and Sims 4 is the same. 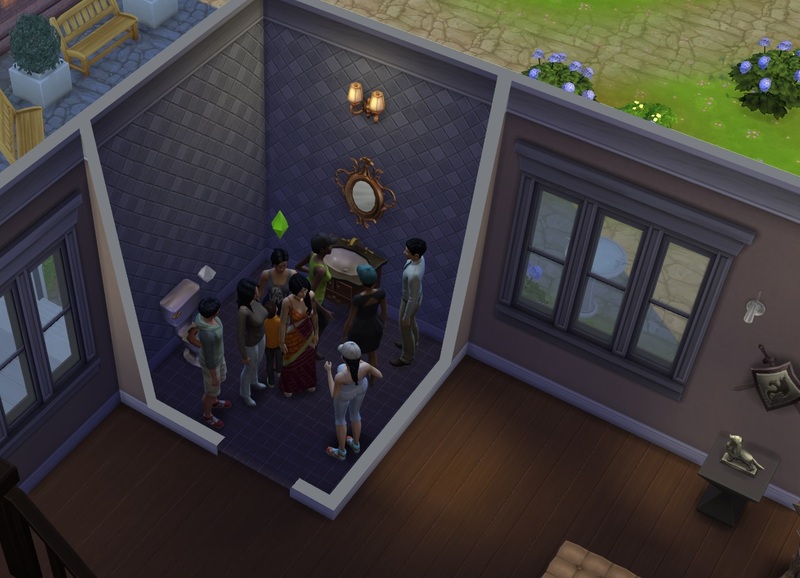 I enjoy socialising in Sims 4, but it shouldn’t be something I have to plan for during every single waking moment (without taking the Loner trait, that is). Sadly I have no other entertaining stories yet. Parcheesi is so incredibly driven to become famous that even her socialising has an agenda (promotion). Perhaps that will change when she reaches her goal… or perhaps she’ll become just one more burned-out B-list rock star.